My newfoundland dogs, and my venture into the world of living with a giant dog, came about five years ago, when I lost my beautiful golden retriever at the age of 14 years. 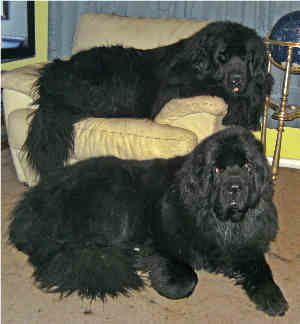 Knowing that another retriever would not be Sammy, I began to research different breeds and found the Newfoundland. I named him Ferdinand and we fell in love at first sight. He always loved playing with other dogs, but as he grew bigger and bigger, I found that the other dogs would run away. This upset me terribly. The only dogs he could play with were ones his own size, who were not afraid, and his face would light up whenever he saw one. Unfortunately, that did not happen often. So as he approached two years old, I decided that he needed someone his own size to play with. I contacted his breeder and found she had a litter due and was happy to put me at the top of her waiting list. And when we brought Joshua home, at the age of eight weeks, I knew I had done the right thing.